I agree, I’d like to see my jewelry but some of it will tarnish quickly if left to the elements, so i’d probably get it and rotate my fav pieces. Definitely a good idea to rotate, I totally forgot about tarnishing. I really love the look of this organizer. Its the first one I’ve found that is not so functional (read: ugly) to be relegated to the back of my closet. It is for sure on my list of things to pick up for my moving back to brooklyn apartment revamp project. I love it. I currently hang my jewelry on a picture frame my friend gave me. She removed the glass and installed a screen. 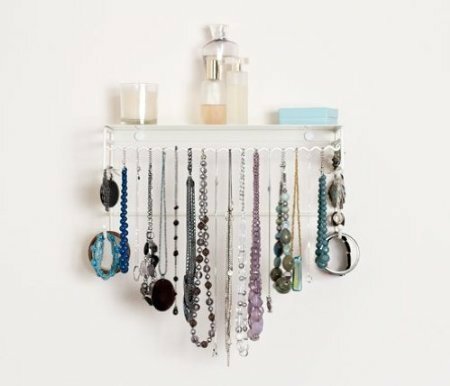 But it’s really only good for hanging earrings. This piece is great. I wish it cam in wood.